Firstly - I'm on TWITCH here! We had a special "test episode" a few days ago for patrons, and my official first public broadcast will be this Sunday, April 8 at 5PM Eastern Time. It's free! Many more details follow in this update below. Basically you can watch me paint live from any computer or phone/device and chat with me & Matt while I work. You can see the "test" episode here to get a good feel for it. Effectively it is like "The Joy of Painting" but instead of Bob Ross you get me, lol. I have new paintings to show you! All of the originals have been (gasp!) SOLD, but prints & other good stuff are available for all of them. "A Dragonling Valentine," "Alice's Prize," and "Ursula" (available through Disney, details here and more info below in this update). My "Alice: The Wonderland Oracle" deck is coming out soon and is available for pre-order! Worldwide you can order from Blue Angel Publishing here (they'll get it in May). USA Customers can order cheaply from Amazon here (they say September). BookDepository won't get it until autumn but they offer free worldwide shipping here. We'll eventually have autographed copies later this year at Strangeling.com . Even better - we are having an autograph/release party on June 30 at Pop Gallery at Disney Springs here in Florida and will have the decks in stock for me to autograph there too! Details about the event are here. 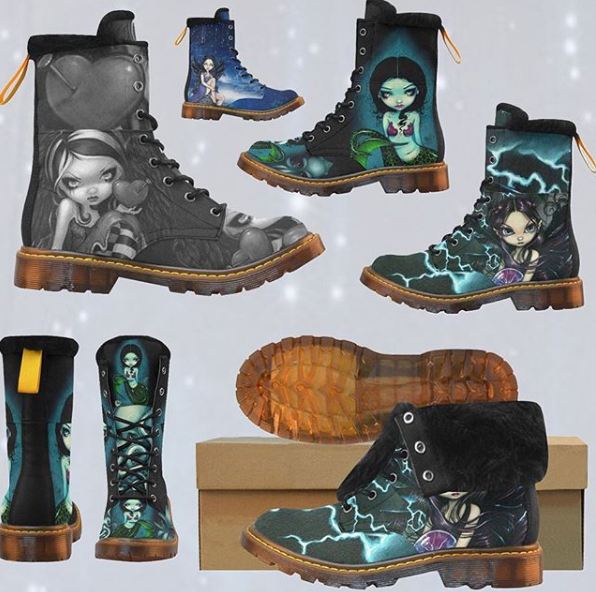 The good folks at Spooky Kook have just released two new lines of my merchandise - BOOTS (they look a lot like Doc Martens, that type of style, and are cruelty-free) with my artwork here (not all these are my designs as this link is just for the boots in general, but they have several) and also wooden bookmarks here- they are located in the UK but ship worldwide. We have loads of collectible enamel pin news! The new glow-in-the-dark Patreon Exclusive "Releasing Fireflies" can be seen here! If you can sign up for the Pin Collector Club through my Patreon here and you will automatically receive "Clockwork Dragonling" (almost finished!) along with the Patreon-only pin "Releasing Fireflies" and you'll get each new Pin of the Month as they are released (along with Patreon-only pins and exclusive bonus pin giveaways, discounts, and more). 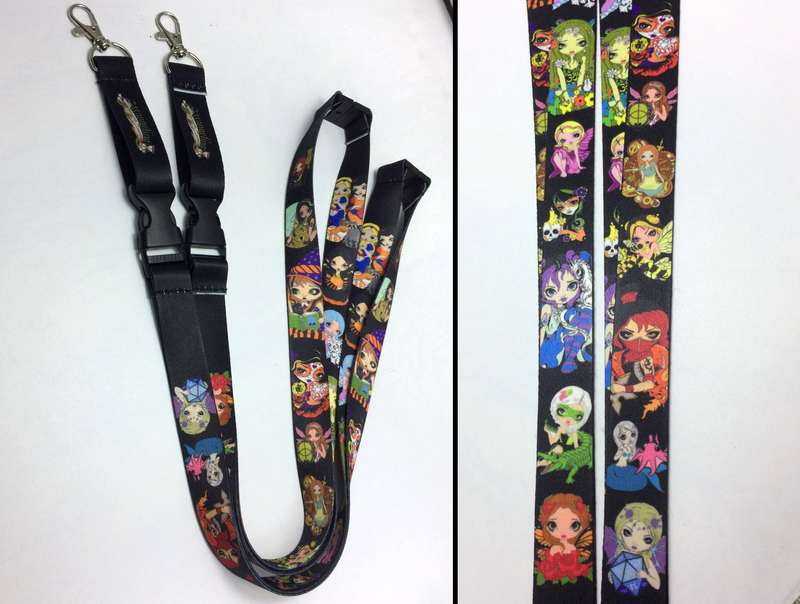 We are releasing a new Strangeling Lanyard too and you will receive the lanyard (and any new lanyard designs we come out with automatically! We have also made our official MegaCon Event Page here with details about "Earth Angel," "Orange Blossoms," and "Venus" (the three MegaCon Exclusive Giveaway Pins). Scroll down for more info. Whew! - and that's it! Now scroll down to see it all! 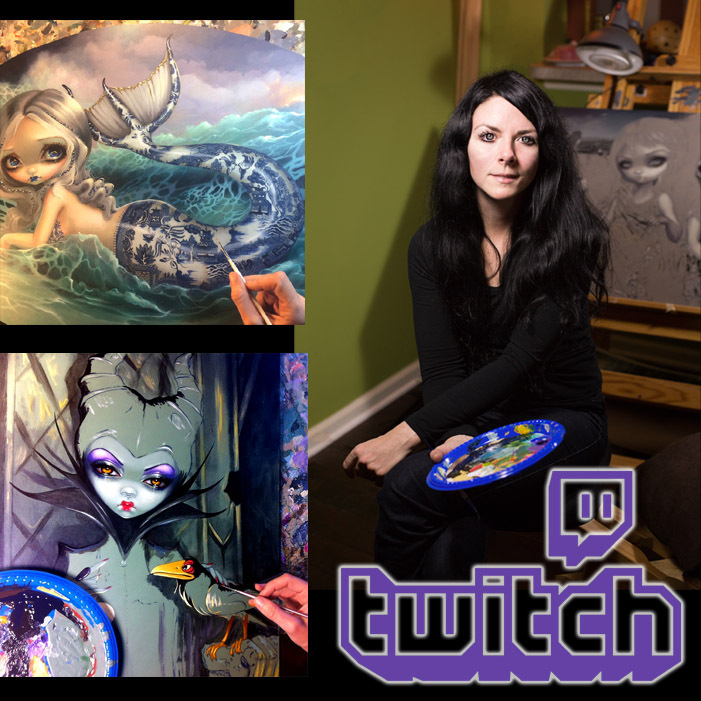 I'll be painting live & chatting all evening. We had a "soft opening" a couple days ago for my Patreon Patrons - it's now available to the public if you'd like to watch the archived video here! Patreon Exclusives - now also grayscale options! I've got a ton of new Patreon-Only Coloring Pages available to download! 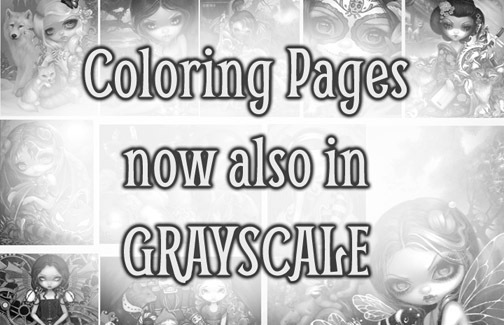 In ADDITION to the traditional lineart formats we also now have GRAYSCALE TOO for each of my Patreon Coloring pages. Only $5 gets you ALL the pages to download as much as you want, past and present, and you can always just join for one month if you want and download them all, lol (I recommend sticking around though, 'cos Patreon is awesome). They have her as prints, postcards, limited edition framed canvas giclees, coffee mugs, and possibly other merch too. I just paint the picture, I don't sell them (Disney makes & sells all official Disney stuff). If you live by Disney (assuming they don't sell out earlier that day and need to re-stock, she is very popular and they can hardly keep her on the shelves!) you can find Disney's WonderGround Gallery in Florida at Disney Springs at Disney World, and at Downtown Disney in California at Disneyland. This is the painting I painted LIVE at my Take Over show a few months back at Disneyland =) The original acrylic painting was sold then, but now they have the prints & such - yay! A. Order online via local third party Disney shopping services such as YourWDWStore here - basically they live near the parks, they pick up the merchandise and mail it WORLDWIDE. They have access to TONS of my Disney stuff and are very nice. B. LOADS of Disney locals are selling them on eBay already. These are not me, these are just random people who buy stuff at the themeparks and re-sell on eBay. 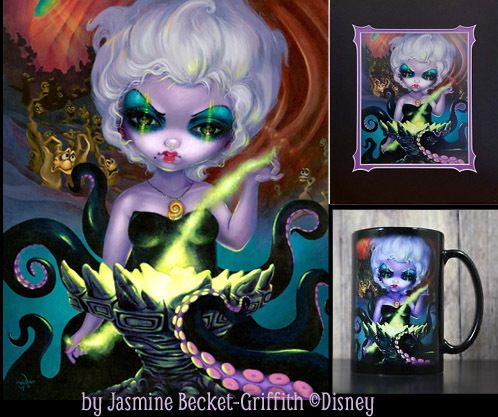 Usually they cost a bit more, and their own individual store polices may vary as far as shipping and payment options, but just go to eBay and search: JASMINE BECKET URSULA and you will find many things, mugs, limited edition framed canvases & more - all official ©Disney merchandise purchased from Disney and being re-sold or auctioned. Lazy? Click this link here and it will search automatically for ya! C. Also check the "Shop Disney Parks" App (download it free from the App Store) - she might be there (I have an old junky phone that isn't fancy enough to get the app, or I'd check myself, lol). It usually takes a while before new images pop up on the App though, or so people tell me. Want your Ursula signed? The Lt. Ed. Canvas giclees have already been signed by me (Disney mails them to my house, I sign them, and then I mail them back to Disney HQ in California, and then Disney mails them back to Florida to the Gallery, lol). So all Limited Edition Ursulas have already been signed by me. Alternately - come to my April 21st OR my May 19th event at Disney Springs' WonderGround Gallery at the Marketplace Co-Op! I'm happy to sign yours there, I'll be there from 4-7pm those two Saturdays (I go there about once a month since I live nearby). As it's published originally in Australia, they tend to get their stock in first at the publishers' own webiste (Blue Angel) - you can pre-order worldwide here for MAY 2018 here or in the UK/International for September here , in the US here for September up at Amazon (for cheaper) here and soon we'll have autographed copies at my Strangeling website (will be a lot more since I have to first buy them and ship to Florida and then ship to KS and then ship to customers, lol - but hey - they are autographed!) for worldwide shipping too. ESTIMATED shipping date is September 2018 - could vary on either side of that. Again though, we'll have the autograph party too at the Pop Gallery at Disney Springs June 30 and we'll have a bunch of early copies in stock there. In fact, if you want an early one that is autographed you can call/email Pop Gallery and they can reserve one for you either in person OR they can mail it worldwide after that night's event ;) Details here . 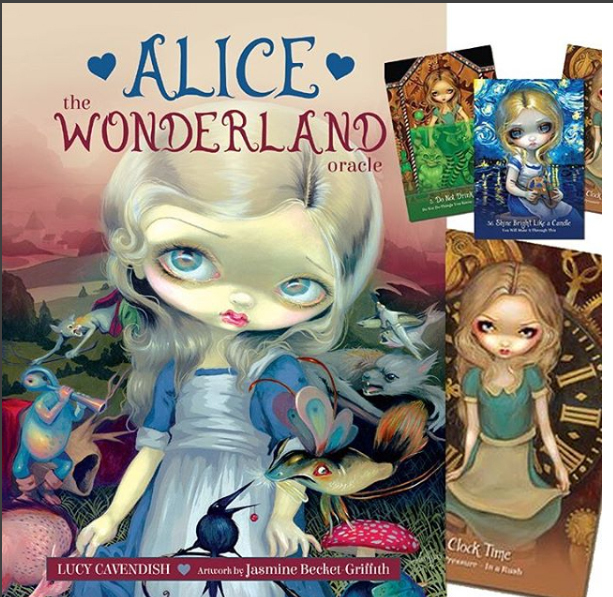 The entire oracle deck is Alice in Wonderland themed, featuring my artwork on ALL the cards, instructional booklet by the magnificent author Lucy Cavendish. I have been working on this for five years and am SO PROUD of how it turned out. Speaking of which - we'll have a corresponding Alice in Wonderland Coloring Book in the works too! Both the coloring books and the oracle decks will be at bookstores worldwide, Book Depository, Books a Million, Barnes & Noble, Amazon, all the usual suspects, ANYWHERE in the world. "Alice's Prize " - this is just a small illustration for one of the cards in my upcoming Alice in Wonderland Oracle Deck (the FINAL illustration! ), but so many of my followers asked me to offer prints of her, so I've up-sized her a bit to make a lovely full sized print of her - turned out adorable. 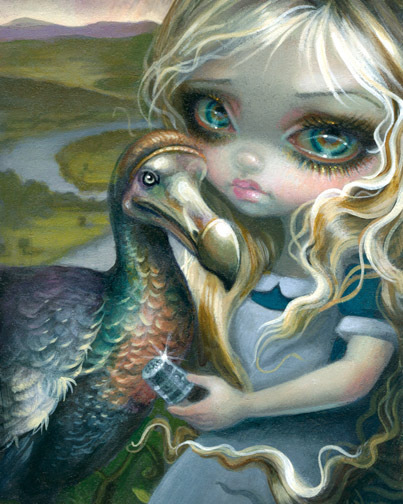 She is indeed the very last illustration for my "Alice in Wonderland" Oracle Deck - specifically for Card 13 – "Everybody has won, and all must have prizes!" This is from the part of the book after the Caucus Race where Alice is presented her prize (a thimble!) by the Dodo! It has a subtle palette and a sort of "Hudson River School" style landscape in the distance. The original painting SOLD in advance to one of my Patreon Patrons before she was available to the public, but we have open edition glossy paper prints as well as Limited Edition Canvas prints all at my website. 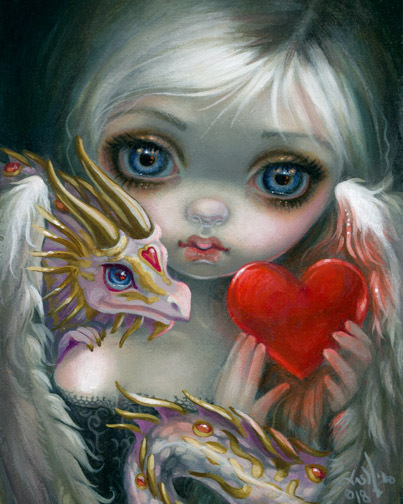 "A Dragonling Valentine" - another little painting of mine, but I decided to offer prints of her based on demand, so I've up-sized her a bit to make a lovely full sized print of her - turned out super cute! Spooky Kook is a UK brand but they will ship WORLDWIDE (including the USA of course). Made from faux nubuck quarter, translucent raw rubber sole and breathable foamed insole. Faux-fur lined collar and faux-suede lining. Four designs! 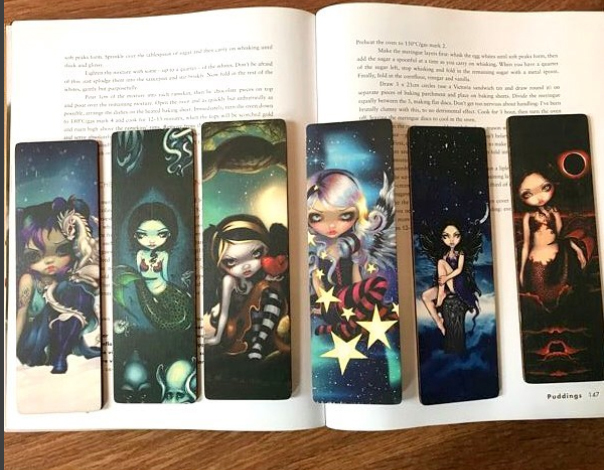 "Heart of Nails" as a greyscale design, "Heavenly Nightshade," "Bringer of Lightning," and "Mermaid with Cephalopods" in full colour - all turned out lovely =) Questions about ordering, shipping, sizing, paying, product questions, etc. - contact Spooky Kook at the link above. So proud of these! Cruelty-free, no animal products! We've got SO many exciting things happening in the world of enamel pins! 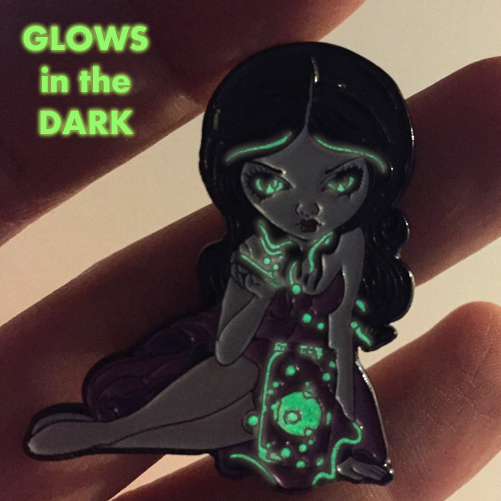 Firstly - the new Patreon Exclusive pin is in stock - "Releasing Fireflies" and she GLOWS IN THE DARK. She is so cool. If you are alrady a Patreon Pin Collector, your "Releasing Fireflies" will be shipped mid-April along with your April Pin of the Month. 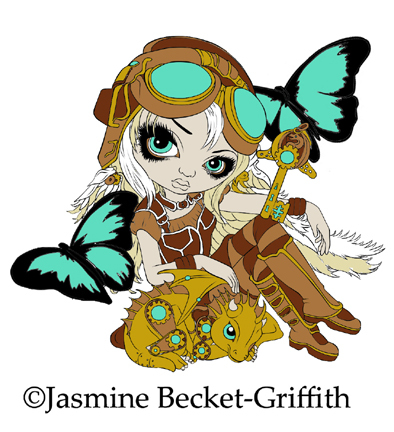 The April Pin of the month will be Clockwork Dragonling, we are finishing her up soon. If you aren't a Patreon Pin Collector yet, hurry and sign up here so you'll get "Releasing Fireflies," "Clockwork Dragonling," and also the new Strangeling Lanyard all at once! You'll also get the new Pin of the Month each month, additional Patreon Exclusive pins, chances to receive Event Exclusives & more. Speaking of Event Exclusive Pins - I have just announced the three new pins for MegaCon! Each will be given away free with any purchase at my booth. These are the new MegaCon Exclusives: "Earth Angel," "Orange Blossoms," (a collaboration between myself and fellow MegaCon artist Carrie Hawks) and "Venus." The specific schedule for the pin giveaways (which ones, how many, which days) are up on my MegaCon Event Page here (each day we'll be giving away 50-100 pins starting each morning when the show opens, so come early). We'll also have other freebies like reusable shopping bags & bamboo fans, etc.